Statics (the analysis of structures in balance) and Dynamics (analysis of the motion of mechanisms). LIMEBA is divided into various experimental modules, each one presenting a subject of Statics or Dynamics. Students are expected to build the experiments on the base panel, where distance measurements are possible due to equidistant spacings between holes on the base panel. Thanks to the Manuals and the necessary theoretical knowledge imparted by the teacher, students shall be able to do all the measurements. 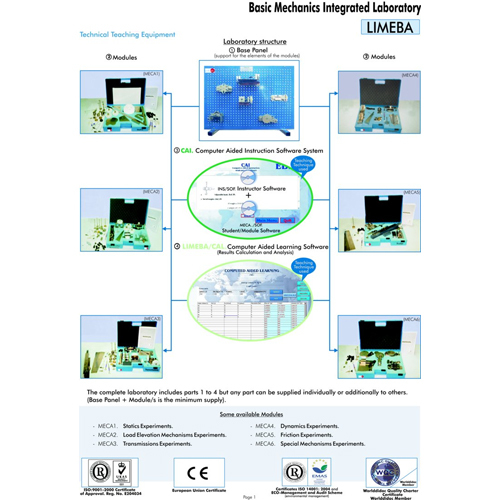 The MECA series is split up into six parts, named Modules, each of which contains the elements needed for completing a specific group of related exercises and experiments. It is the supporting structure where the modules’s elements are mounted in order to undertake the experiments and hence, the base panel is necessary along with any module. The panel is pierced with equidistant holes that help students to take measurements. Each module is formed by different experiment components and is packed in a high quality case. The experimental elements of each module are made out of special anodized aluminium, a high quality material to achieve total precision and to obtain 100% accuracy in carried out practices. 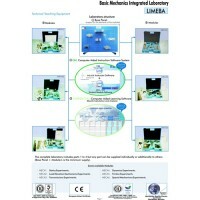 Manuals include laboratory sheets for every experiment, listing the elements needed in every experiment and giving the correct position of each element on the base panel. These sheets also give valuable guidance on how to conduct the experiments and recording the results. There is a particular manual for each Module. (8 manuals normally supplied). Accessories included for a normal working operation.  MECA2. Load Elevation Mechanisms Experiments.  MECA6. Special Mechanisms Experiments. The best help in classroom for both teacher and students. 3.1) INSTRUCTOR SOFTWARE: INS/SOF. Classroom Management Software Package (Instructor Software). Only one package is needed per classroom. Helps creating databases, reports and statistical comparisons among many more features. 3.2) STUDENT SOFTWARE: MECA./SOF. Computer Aided Instruction Software Packages (Student/Module Software). Each “MECA” type module has its own package. It gives the students the proper assistance on theoretical knowledge as well as in practice, presenting exercises and questions. Windows, based software, simple and easy to use, specifically developed for use with EDIBON Basic Mechanics Modules.